March 16, 2015 by Henny Kupferstein, M.A. 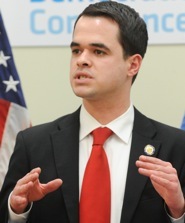 Senator David Carlucci, Chair of Mental Health and Developmental Disabilities Committee, sponsors VR Communication Support for Autistic Consumers. Senate Bill No. S04256 (A05141) directs the commissioner of education (John B. King Jr) to amend the education law in relation to vocational rehabilitation services to add a new section (1004-c) for communication support as a vocational rehabilitation service. The deputy Commissioner of Adult Career and Continuing Education Services (Kevin Smith) is to implement the service statewide effective January 1, 2016. First introduced to the New York State Assembly by Angelo Santabarbara as Bill No A05141, This bill is rapidly gaining the support of national organizations that are directly involved with servicing autistic adults. The American Speech-Language-Hearing Association (ASHA) submitted their letter in support of Bill No. A05141. Currently, VR spends 80% of their budget for job coach specialists to train individuals in skill such as mopping floors and bagging groceries. These specialists only need a GED to contract with the state, for up to $42 per hour. Instead, the bill asks VR counselors to refer to speech therapists or special education teachers to support communication in the workplace. This support would be consistent with the needs of the disability and appropriate use of the funding available in the budget. Currently, special education teachers and speech therapists are trained in social pragmatic language disorders, and the nuances of how these challenges interfere with the workplace. With less spending and more appropriate services, autistic adults stand in an excellent position to redeem themselves of the 90% unemployment rates, depressing the community. Contact the chairs of the overseeing committees and ask for them to put this bill on the agenda. Share this page [Help Pass Bill A05141 – VR Communication Support for Autistic Consumers], and make a difference. Time to provide folks on the Spectrum with the services that meets their needs instead of trying to shoehorn them into outdated modes.